Go go go! — Run test on this tireless little bud. PF - Fitness cycles — Some looped characters for a fitness project. 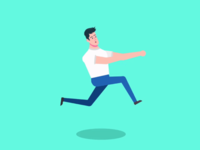 Frame by frame | Run Cycle — Study of frame by frame animation. Love Death & Robots Run Cycle! Stay looking good for the gram. Pixel — Hey! It's me! Look at me go! Hope I don't get tired!